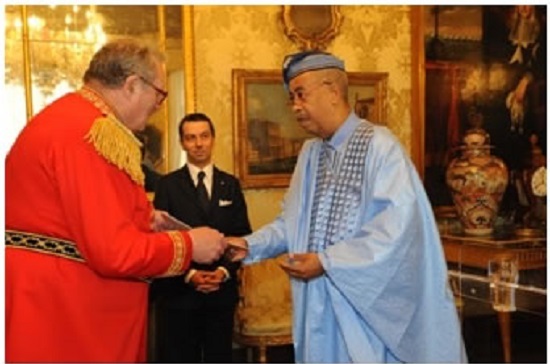 Liberia’s Ambassador accredited to the Holy See and the Sovereign Order of Malta Rudolf von Ballmoos has presented his letters of credence to the Holy Father, Pope Francis at the Vatican City and the Prince and Grand Master of the Sovereign Order of Malta, Fra’ Matthew Festing at the Magisterial Palace in Rome, Italy. A dispatch from the Liberian Embassy in the United Kingdom says during separate statements at the two ceremonies, Ambassador Rudolf von Ballmoos extended special thanks on behalf of President Ellen Johnson Sirleaf to the Holy See and the Sovereign Order of Malta for the enormous support provided Liberia over the years in the areas of education, health and humanitarian services in support of government’s effort to eradicate poverty and consolidate the peace process. 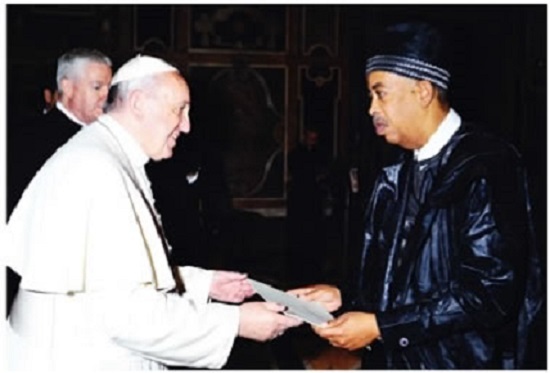 He made a specific request to the Holy See to support a regional education and awareness campaign with specific focus on religious tolerance, noting that “with the spread of different religious beliefs across the continent of Africa, it is prudent for people of different faiths to coexist peacefully and tolerate one another”. On the global scene, Ambassador von Ballmoos noted that “Liberia will continue to support dialogue and non-violence in the resolution of internal conflicts. He said Liberia is pursuing a long-term national development agenda, The Liberia Rising Vision 2030, which aims to propel Liberia into a middle-income country capable of meeting and sustaining its own development aspirations by the year 2030. “Towards, this end, we encourage Foreign Direct Investment in the vast resource based of the country, including the Agriculture and Mining sectors,” he added. In response, Pope Francis said ” the proliferation of weapons of every type leads in the opposite direction of peace that we all speak about. The arms trade has the effect of complicating and distancing us from a solution to conflicts, all the more so since it takes place to a great extent outside the boundaries of the law. Therefore, I consider that, while we are gathered in this Apostolic See, which by nature is invested in a special service to the cause of peace, we can unite our voices in expressing hope that the international community may make new, concerted and courageous efforts against the proliferation of weapons and to promote their reduction”. The Holy Father mentioned that another challenge to peace, which “unfortunately takes on, in certain regions and in certain moments, the nature of a full-blown human tragedy”, is that of forced migration. He commented that it is a very complex phenomenon, and recognised that important efforts are being made by international organisations, states, and social bodies, as well as religious communities and volunteer groups, to respond “in a civil and organised way to the most critical aspects, emergencies, and situations of greatest need”. Pope Francis noted that the global community cannot limit itself to reacting to emergencies, but rather the moment has arrived to face it with a serious and responsible political outlook, involving all levels: global, continental, macro-regional, in relations between nations, and finally at national and local levels. Also speaking at a separate ceremony, His Most Eminent Highness Fra’ Matthew Festing said beyond its humanitarian activities, the Sovereign Order of Malta is also committed both to building new bridges of understanding so as to foster dialogue and respect for cultural diversities and to promoting human dignity as the most effective strategy for eliminating inequalities between countries and social groups. “I am certain that the recent accreditation of the first permanent representative of the Sovereign Order of Malta to the African Union will enable an even more effective collaboration among the different countries for improvement in the living conditions of the populations of Africa. “In addition to our engagement in Liberia, we have identified new projects relating to the training of dentists and doctors, as well as the fight against epidemics and renewed shipments of medicines and medical equipment for hospitals in Liberia” he concluded.